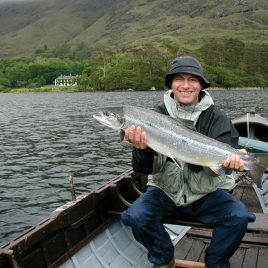 Delphi Fishery is located in Connemara, County Galway offers top quality salmon fishing in beautiful mountainous surroundings. There is a wide variety of fly fishing on an exceptionally pretty river, and two spectacular lakes. The Bundorragha (bottom of the dark valley), is one of the most beautiful rivers you can fish. At just over 1.6kms long it has over 20 productive pools. It is almost always suitable for fly fishing, even after a heavy spate, due to the settling effect of the lakes upstream. Finlough (Bright Lake) is the most popular and prolific of the lakes. It is overlooked by the lodge, is quite shallow and can produce a fish from almost anywhere. Doolough (Black Lake) is one of the deepest lakes in Ireland and being surrounded by steep mountains is quite a formidable sight. There are days when choosing appropriate words to describe its rugged beauty are difficult to select. Many salmon are taken here every year but it really comes into its own with good sea trout fishing in August and September. Glencullin is the final destination for the migratory species. It is not a big lake but its rugged beauty is extreme. There is also the added attraction of two small islands, one natural which is an oasis of wild vegetation and the other is a Crannog i.e. man-made and probably would have been an ancient defensive settlement. It is a real favourite with sea trout anglers with the occasional salmon also being caught.